I am having the hardest time believing that Autumn has arrived. Maybe that’s because in Illinois it is currently 90+ degrees on the daily and I still have my air conditioning cranked. However, that doesn’t mean that any day now the weather won’t start acting like it is supposed to. I can not wait for chilly autumn days, sweatshirt weather, and a bonfire or two. I also can not wait to visit every pumpkin patch and apple orchard that I can over the next few weeks. Give me all of the apple cider donuts, apple cider slushes, and cider wine! With autumn arriving, comes autumn wedding season which is one of our favorites! The color palettes and decor gets cozier and warmer and we love to see this change from the lighter and brighter summer weddings! Today I want to share with you a few ways to personalize your autumn wedding to make it seem more cozy, intimate, and personalized. Last year we got together with a team of amazing creatives to put together a wedding that was both feminine and autumn themed. I still can not believe that it has been *almost* an entire year since we worked on this, but it makes me even more excited to relive the day in all of the details! 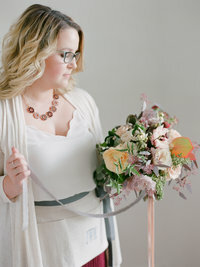 Brandi + Jesika of Bridal Brigade created a warm and glowing look for our bride. Avery absolutely shined! 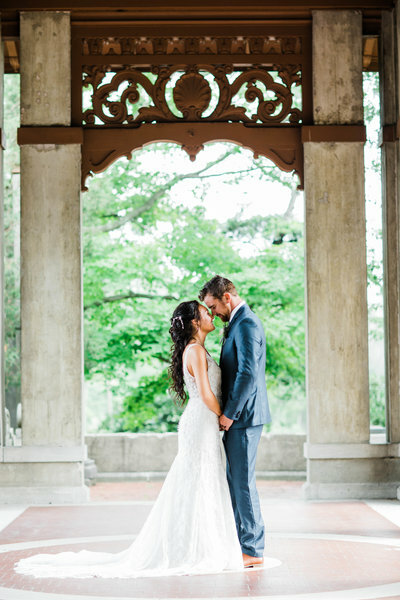 We chose a gown that had intricate detailing, flattered our bride, and truly had that royal princess vibe. Savy’s Chic bridal boutique provided this gown, how gorgeous!! 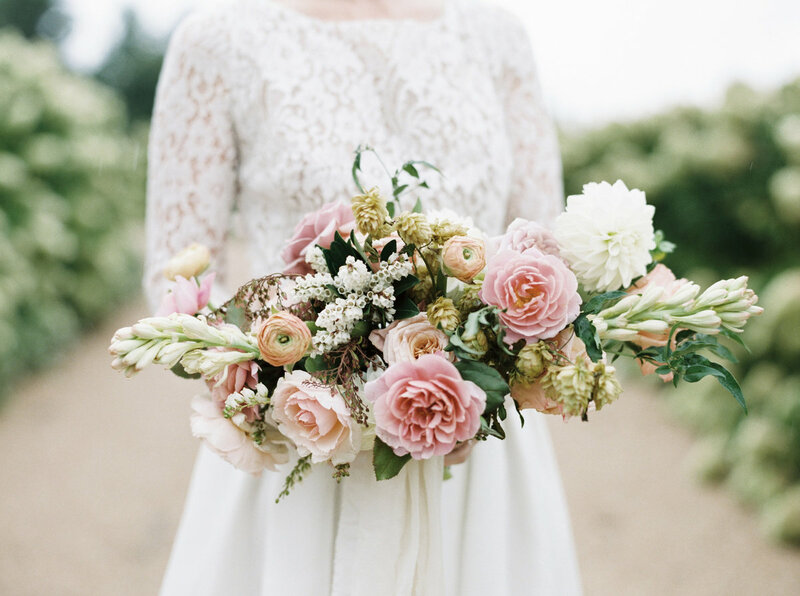 When most people think of autumn weddings, they don’t necessarily think of the color blush. However, we really wanted to bring this trending color into the new season. We even found a special way to bring it over in to Avery’s bridal details, with these stunning Badgley Mischka embellished pumps! 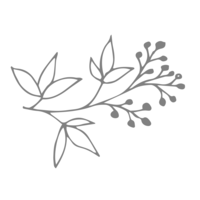 Our great friend, Emily, of Dashwood shop created the most stunning paper goods for this project. In our tablescape design I wanted a few things. I wanted it to feel warm, luscious, and feminine. Blush was such a trending color last year, and to be able to bring it into a fall wedding was a project I couldn’t wait to take on! Kathy of Flowers By Book provided gorgeous floral designs for a luscious, full centerpiece that was comprised of one larger focal centerpiece, paired with two smaller arrangements on the ends of the table. We then filled in the space with grey candles and a blush runner. 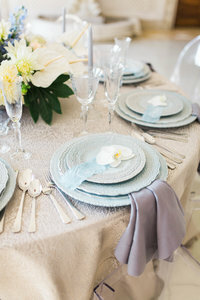 In order to make the table cohesive, we tied the grey color of the candles in to the individual place settings. At each place setting we brought together soft blush toned dinnerware, with just a hint of dark grey in a charger plate, napkin and ties for the flatware. Greenery adorned each place setting next to menu. We tied the whole autumn theme together with mini white pumpkins tied off with place cards for each guest in custom calligraphy from Dashwood. All of this came together perfectly on this gorgeous custom farm table from pearl and sons construction! We chose to create three different vignettes for guests to interact with that both personalized the event, but also “cozied” it up. The first of those was this blanket station. We paired the blankets with a cute sign from Dashwood that was lettered with a quote that was different of those that you see every day. Paired with the bride and grooms pumpkins, you have a quaint and cozy vignette for guests to grab blankets before heading over to the fireside. This vignette, might be my personal favorite ever. Because,sweets. Here guests get create custom hot chocolate drinks and smores. These are just any smore though, those are white chocolate covered marshmallows from Barb at The Noble Cakery. I also spy with my little eye, some more gorgeous signage from Dashwood! Macarons, mini bundt cakes, bundt cakes, a 2 tiered delicious cake…. oh my! This sweets station from The Noble Cakery was full of items that were sure to keep tummies full and happy! It is no secret that I love signage, but more than that I love unique signage. Therefor, I like to dig deeper than the surface of Pinterest for quotes that everyone is using. Here we pulled new and exciting quotes for Avery and Jarred’s portraits, that were later displayed. Without the following creatives, this project would not have been what it is. 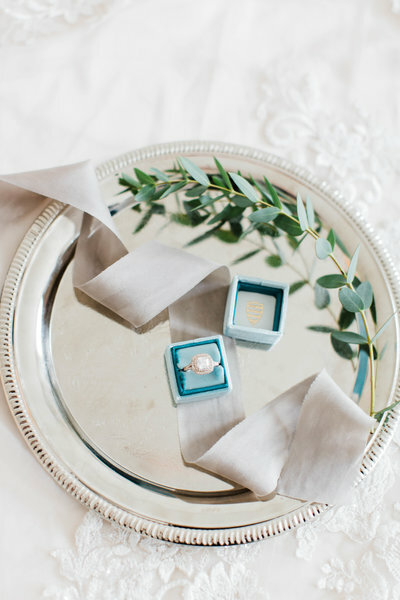 We are so honored that this shoot was also published by The Every Last Detail Blog, that feature can be checked out here. We love how Lauren tells the story of the shoot!